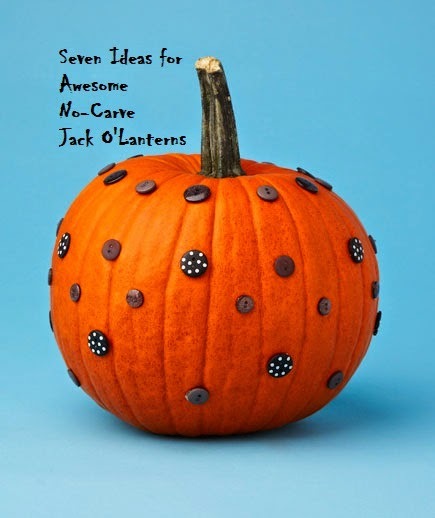 Every year I go on the hunt (and by "hunt" I mean "surf Pinterest") to find cool ideas I can use to make the most awesome Halloween Jack O'Lanterns EVER. But there's always just one catch - I don't want to have to actually carve the pumpkin because kids and knives are not my thing, and honestly, pumpkin guts are not my thing so much either. 1. Create a Book Page Pumpkin - Creations by Kara's tutorial explains how to turn an old book into a fantastical pumpkin. Sooo amazing. 2. Make Glow-in-the-Dark Funkins - Martha Stewart tells how to make these cool creations using a funkin (foam pumpkin) and glow-in-the-dark powder. I also had success using Glow in the Dark Duck Tape. 3. Decorate a Cute as a Button Pumpkin (pictured above) - Real Simple has instructions for making this easy polka dot pumpkin from re-purposed buttons. You can buy over 100 black buttons from Amazon for under six dollars, making this an easy and inexpensive way to decorate a pumpkin. 4. Paint a Chalkboard Pumpkin - Zakka Life's directions for this clever DIY project explains just how to do it, and I love that you can change it as often you like with the swipe of an eraser. 5. Add a hat and mask for a quick Pumpkin Disguise - I found this idea from Better Homes and Gardens. It's also turned out cute with tiny outgrown baby Halloween costumes, if you want to dress up the pumpkin entirely. 6. Apply tickers for an Instant Goofy Pumpkin - it's as easy, peasy as it sounds. Just add stickers, you can even purchase special Halloween Jack O'Lantern Face Stickers (12 sheets for $6.99) on Amazon. 7. Use push-in sets to create Pumpkin Characters - these recently have become really popular, so you can find just about all the kid-favorite characters. Pictured here, Darth Pumpkin. You, too can have a Star Wars Darth Vadar Pumpkin for the low price of $21. It seems a little pricey, but I still sorta want to get one for my Star Wars loving son. Also available: Mr. Potato Head ($12.00) and Mrs. Potato Head ($19.99) and a whole bunch more. Need any more ideas? Here are the no-carve pumpkins I shared last year. Whatever you create, have fun and Happy Halloween!